There are legions of fitness apps promising to help you run further and faster but none is quite like the fairly new UA Record app. 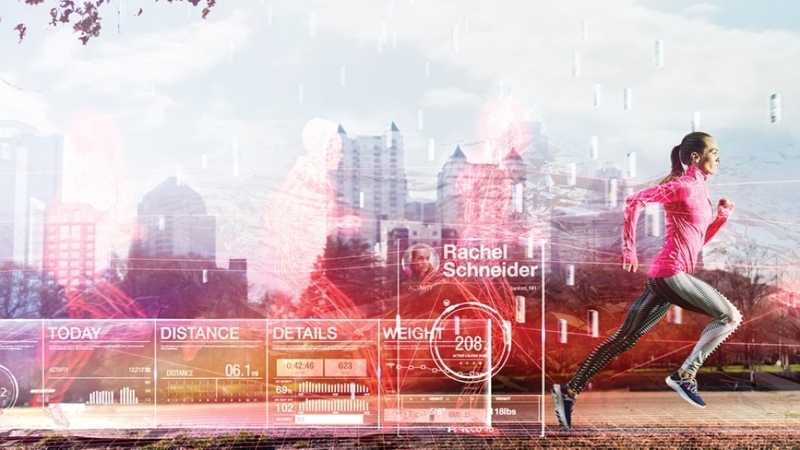 Part of the new breed of tracking platforms, UA Record understands there's more to hitting peak performance on the track, treadmill or trails than simply logging daily miles. Taking a more holistic approach, it collects data on your movement, workout activity, nutrition and sleep quality, allowing you to make crucial correlations on how this is affecting performance. Here's our top tips on how it can make you a better runner. The UA HealthBox package is billed as a comprehensive fitness tracking ecosystem, but the companion UA Record app is far from a walled garden. It welcomes data from a wide variety of the third-party apps and devices. You can link an Apple Watch and make use of its heart-rate tracker and activity tracking abilities, or sync data from Garmin, Fitbit, Jawbone, Misfit, Suunto, Polar and Moov devices. It also plays nice with apps like MyFitnessPal, Samsung's S Health and Google Fit. So if you're a runner who likes to use different devices for different purposes, for example Moov for cross training and Garmin for training runs, UA Record is a great way to aggregate all your training data in one place. Once accounts are linked in the My Apps & Devices menu, a quick tap of the "Sync" button will ensure all your info is current. Checking one app instead of two or three sounds like a much better solution to us. There's an important side to training and improving that GPS and optical sensors can't capture, and that's the emotional, subjective side. Despite our best efforts, factors like sleep quality, stress, diet and hydration often slide beyond our control and have huge knock-on effects on performance. The app's dashboard now offers a "how do you feel?" feature that finally takes this into consideration. Having an 8-out-of-10 day? Why not push for that PB? Struggling to muster a three on a Monday morning? Don't punish yourself. It's may be better to let your body recover than risk injury. Eat well, hit the sack early and go again tomorrow. This setting is also great for picking up on trends in your training cycles. For example, if you're continually logging twos and threes on days following your long runs, then it might be time to explore whether you're giving your body the right fuel and enough sleep to aid recovery. Just because we test about 14 wearables on each and every run, doesn't mean you have to run around the local park loaded with tech. The fewer items you can wear to achieve your goals the better, right? The UA Sport Wireless Heart Rate earphones made by JBL have a heart rate monitor built-in and let you to ditch the trusty chest strap. Paired up with the app, these Bluetooth buds will give you voice updates as you go, simply by tapping the right bud. You can also configure a read-out at certain intervals, so you know whether you're hitting your zones without faffing around in the app with sweaty paws. The over-the-ear buds also feature 5.8mm dynamic drivers and with JBL's Pure Bass Performance on board they also ensure there's plenty of oomph when the time comes to trigger the power song. Running long distances can be lonely and it's hard to replicate the competition of a race environment in training, so why not step things up creating challenges for your friends and followers? Whether it's distance covered, calories burned or most workouts, the chance to top a Leaderboard could be what you need to push through the pain barrier or head out for a run… even when it's tipping down outside and Game of Thrones is on the telly. These Leaderboards are also brilliant if you have a training mentor. They can see what you've run, how you performed, whether you've skipped a session and give you good feedback within the UA app. We'd like to see UA add the ability to join active challenges rather than have to set them up yourself, or rely on invites from friends. Some runners are motivated by a sense of community rather than intense competition, which is what makes running clubs so fruitful. If you're unable to join a club due to schedule and/or location, the UA Record app can help fill the void. Search your Facebook or Email contacts to find friends already using UA Record or invite them to join. You can even also post your workouts to the public Feed and receive encouragement from the vast community of users. As runners, it's easy to focus only on how many miles we've logged and how fast, but general movement, good recovery through sleep and a decent nutrition program are essential to improving your performance. It is no coincidence each of these is given an equal slice of the 'pie' chart in the UA Record app's Dashboard. You can use UA Record to keep you disciplined on the stuff outside the run. Set targets for steps, sleep and calorie intake and use the app to log those all-important strength workouts and non-step cardio activities like yoga. Personal bests are made as much in the kitchen as much as they are on the track. The UA Record app enables you to integrate the MyFitnessPal app (also owned by Under Armour) to pull in your nutritional information. The UA Record app also enables you to rate calorie consumption as Light, Medium and Heavy in any given day. Having all of the information on one screen and seeing how one might offset the other is a great way to ensure you're eating right to power your training and recovery. It's also a great way to keep a record of how you performed in relation to pre-race dinners and breakfasts, helping you to refine your routine for next time around. It's also worth mentioning that the UA Scale (part of the UA Health Box platform) will allow you to track your weight and body fat percentage within the UA Record app. The UA Record app has a robust sharing ecosystem that enables you to share your 'Today' view to sources outside of the app. You can post the image to Instagram, Facebook, Twitter or perhaps the WhatsApp groups featuring training partners. If you get your rewards from seeing those likes and comments flood in after a particularly triumphant day, then share away. Got any questions about how to use UA Record? Let us know in the comments below.